Town Meeting in 1775 had some difficult decisions to make. To start, they had to decide whether the town would appoint a Committee of Correspondence, Inspection and Safety. This obscure, even boring, name sounds like an old-fashioned take on the Department of Public Facilities. But what it really meant, was that Needham was going to war. The Committees of Correspondence were established to coordinate the opposition of the individual towns toward the British actions, pass along important intelligence, and generate propaganda favorable to the Colonies and unfavorable to the British. They were agitators, and they were spies. In 1773, two years before, Needham had voted against forming a Committee. But conditions had changed. The Royal Governor had dissolved the MA Legislature. In April 1775 Needham sent 185 men to answer the Lexington Alarm, and five were killed. One month later, in May 1775, Town Meeting agreed to form a Committee and gave the job to Capt. Robert Smith. In doing so, they were publicly and officially declaring that the town was in rebellion against the British Crown. On the other hand, they also had to settle the vexed question of whether the pigs should be allowed to run free or be penned up. Left to themselves, hogs would eat the garbage off the streets or roam in the woods and eat acorns, which was cheaper than providing fodder, and cleaner than pens (they smell really bad, even by barnyard standards). However, they could be very destructive, dig up people’s trees and crops, and form aggressive packs (like wild dogs). There was even a town officer, the Hog Reeve, whose main responsibility was to assess the damage they caused. On the other hand, if you penned them up, they were more costly to keep, they stank, and the garbage built up in the streets, which attracted rats. There was no good answer, and the solution went back and forth every few years. 1775 was a run-free year. For the Needham History Center & Museum, Town Meeting in 1775 is where the action is, which is why we are discussing spies and hogs. Thanks to a grant from the Needham Education Foundation, the Needham History Center, together with Suzanne Wilcox, then Principal of the Eliot School, and a group of Needham teachers, created a new schoolhouse program for the fifth grades on Town Meeting in 1775. 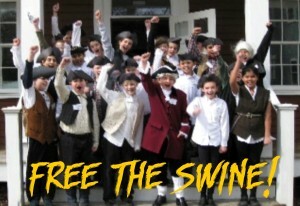 Using the real transcripts and town records from 1775, the kids construct debates over the issues of the day and hold their own 1775 Town Meeting at the Schoolhouse to vote on their resolutions. This program joins the very successful 1850 Schoolhouse Day program that is now regular part of the third-grade curriculum. Every May in Needham, Annual Town Meeting continues a ritual that has been unbroken here for more than 300 years. And if the issues these days are more on the order of free-range hogs and less of armed insurrection, really that’s all to the good. Our history is a road that leads out of our past, and into our future. We hope we learn from our mistakes rather than repeat them, and raise our kids to appreciate the achievements of the past and the possibilities of the future. We would rather be chasing pigs than preparing for war.